On this episode of Talking Biotech, University of Florida researchers Kevin Folta and Brady Holmer tackle two pressing questions in science: communication and sleep. Public understanding of science is essential to a properly functioning society. But with so much misinformation proliferating through social media, what can academics do to help consumers develop a better grasp of complex scientific topics? Folta and Holmer summarize their approaches to promoting science literacy among the public, and explain why other researchers should join them. Everyone knows that miserable feeling of waking up after a night of poor sleep. Along with side effects like worsening heart function and slowing metabolism, that feeling of lethargy signals how important a good night’s rest is to our survival. Now science is revealing just how deep the connection between human health and sleep goes, showing that sleep deprivation can actually damage our DNA. 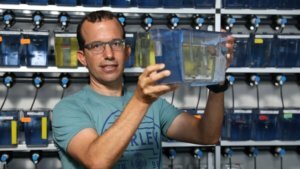 With the help of Zebra fish, Professor Lior Appelbaum and his team at Bar-Ilan University in Israel have shown that sleep is an essential state in which neuronal activity is put on hold and cells repair their genetic material. Applebaum joins Folta and Holmer to discuss how his research helps fill some of the gaps in our knowledge of sleep. Kevin M. Folta is a professor in the Horticultural Sciences Department at the University of Florida. Follow professor Folta on Twitter @kevinfolta and email your questions to [email protected].